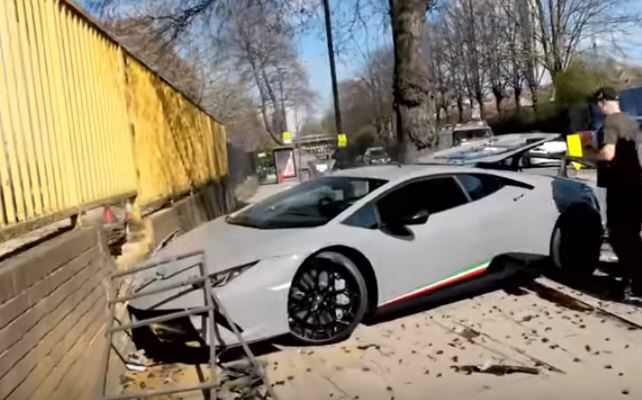 The owner of a £215,000 Lamborghini was all too happy to show off his flashy car to an admiring crowd, but it ended in tears when he lost control and smashed the vehicle into a wall. I’m sure we’ve all been witness to a cocky driver loudly revving the engine of their fancy sports car. I suppose after spending hundreds of thousands of pounds on it, the drivers would want people to pay as much attention as possible as they race off into the sunset, but it can still be annoying. However, the driver of this particular sleek grey Huracán Performante probably wished there weren’t quite so many people watching as he put his foot down. The driver took the expensive vehicle to the HR Owen Supercar event this weekend, which took place in Acton, London. After the show, the proud owner pulled up in front of a crowd of spectators, many of who were snapping footage of the impressive ride. Take a look at the devastating events which followed below. The driver put the car’s impressive acceleration to the test and sped off down the road, but within seconds lost control and started to swerve towards stationary traffic. He attempted to correct his steering but overcompensated, and ended up turning the car away from the road altogether. It smashed into a brick wall and a tree, crushing the bonnet and destroying the boot. 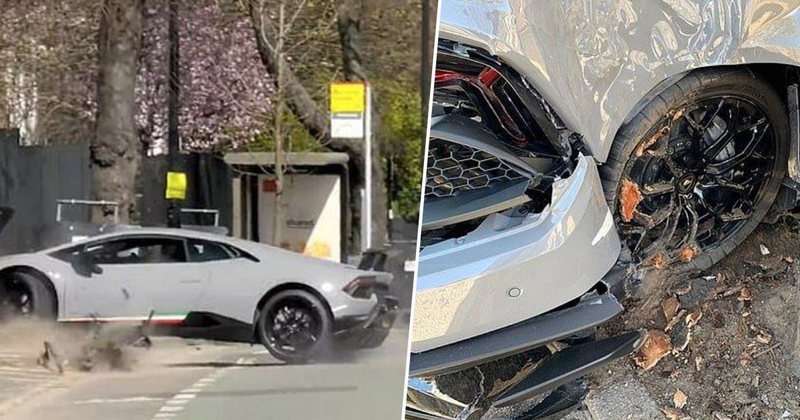 Luckily no pedestrians were in the car’s wayward path, and the driver emerged unharmed – though he was reportedly later seen in tears, which is understandable considering his pricey supercar was said to be written off. One witness, who runs an Instagram account called London.Carspots, told the Evening Standard the driver had used launch control, which aids the speedy acceleration of a car. He was revving and decided to do a launch control, at which point he lost control because of his cold tyres. He hit the tree, went up the kerb and hit the wall – I’m pretty sure he was crying when he got out. It was easily a write off. Loads of people stopped to take pictures after it happened and the recovery van turned up an hour later. According to the Mail Online, another person heard the accident from a nearby street and went to investigate. As soon as I heard it, I rushed over to where it happened. The drivers were not participating in drag races, they were just making some noises for the crowd and accelerating away fast. The crowd was loving the cars making noise and driving away fast from the event, but everyone seemed shocked and sad to see the crash. It was lucky no one got hurt in the incident; the events should teach everyone a lesson about showing off in cars! Even if he replaces the Lamborghini, I’m sure the driver won’t be trying a stunt like that again.